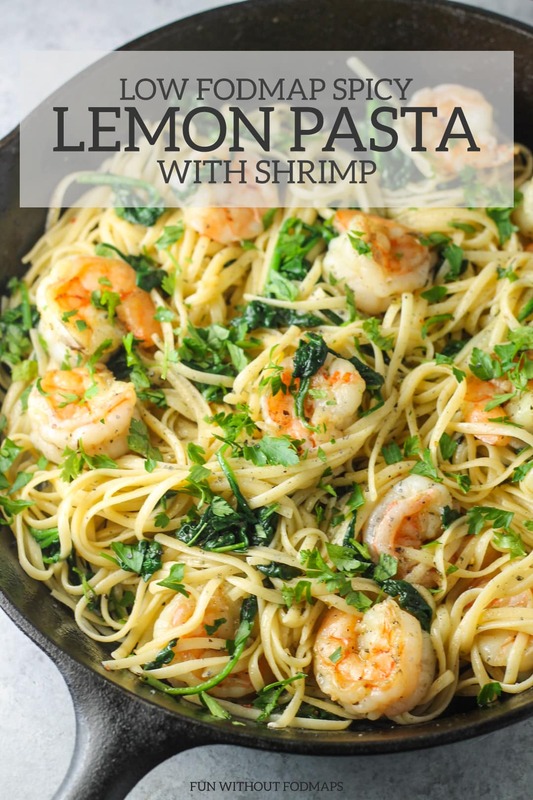 Whether it’s an easy weeknight meal or simple stay-at-home date night supper, this Low FODMAP Spicy Lemon Pasta with Shrimp recipe is delicious! And, it just happens to be gluten-free! 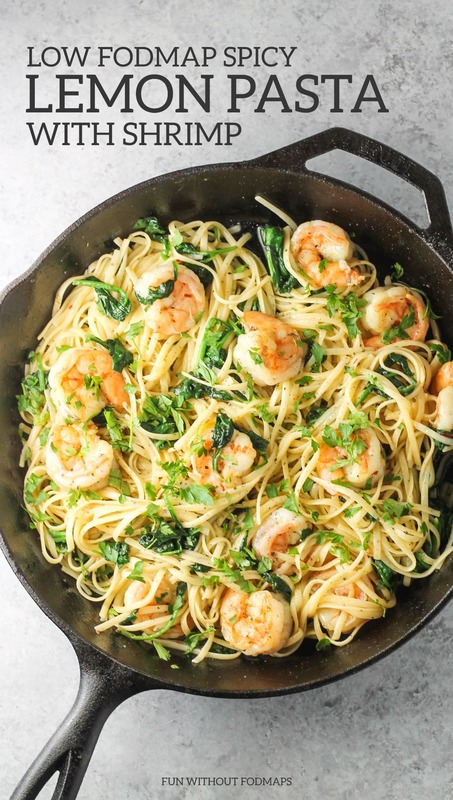 Rich, buttery and oh-so-delicious, this Low FODMAP Spicy Lemon Pasta with Shrimp recipe is nothing short of flavor-FULL! 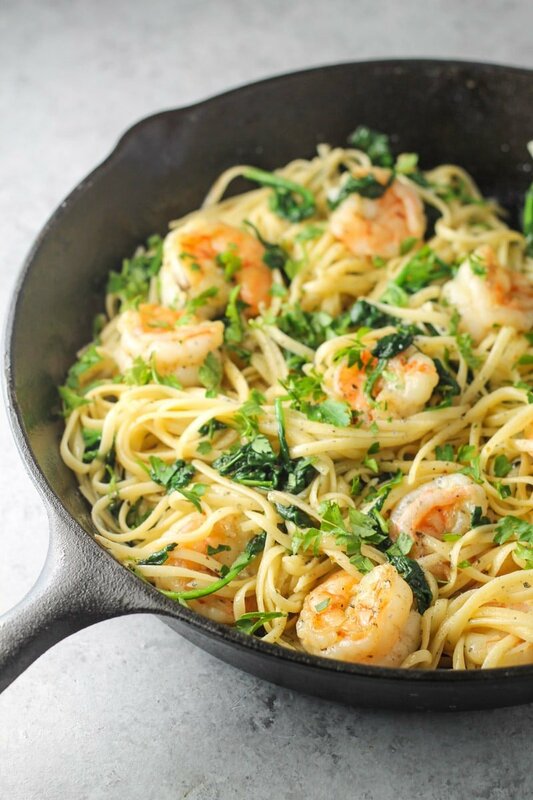 I have been using Ancient Harvest® Supergrain Pasta™ Linguine and I love the texture! In fact, my wheat-tolerating husband even enjoys this pasta! Fortunately for us low FODMAP folks, many kinds of gluten-free pasta are also low FODMAP. Typically, gluten-free pasta will be made from rice, corn, quinoa or a mixture of these gluten-free grains, but always double-check the ingredients. Gluten-free pasta tends to have a little different texture than traditional wheat-based pasta, however, after years of trial and error I’ve found several that I consistently go back to. For this recipe, in particular, I enjoy Ancient Harvest® Linguine (made from corn and quinoa), Tinkyada® Brown Rice Fettuccine (made from brown rice), or if you’re in the Midwest, Taste Republic’s Refrigerated Gluten Free Fettuccini (made from brown rice). If you’re looking to add sides to this low FODMAP recipe, I would suggest adding a side of veggies and maybe a serving of fruit for “dessert”. I may be a little biased because it’s one of my favorite veggies, but I think steamed or roasted broccoli with just a touch of salt would be delicious with this dish. The low FODMAP serving size for broccoli is ¾ cup or 75 grams. A side salad with romaine, a couple of cherry tomatoes and cucumber slices with a simple vinaigrette of olive oil, red wine vinegar, and Italian seasoning would be another delicious and nutritious veggie pairing. Strawberries: 10 medium or 150 grams. However, FODMAPs were not detected in this food. Cook the gluten-free pasta according to the package instructions. Drain, toss with a little olive oil to prevent sticking, and set aside. In a large pot, heat the olive oil and 1 tablespoon butter. Add the shrimp and cook until the shrimp start to turn pink; flipping once. Once the shrimp are almost cooked, stir in the Italian seasoning, red pepper flakes, and spinach. Cook, stirring occasionally, until the spinach is wilted. 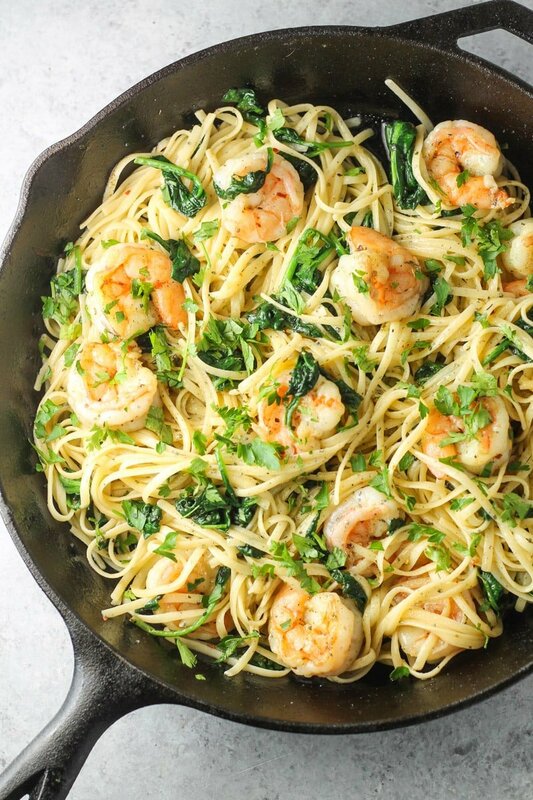 Add the cooked pasta to the shrimp and spinach mixture. Add the remaining 3 tablespoons butter; stir until the butter is melted and everything is well mixed. Top with lemon juice, fresh herbs, salt, and pepper. Serve warm. Spinach: A low FODMAP serving is 1 ½ cup or 75 grams. Made it without shrimp. Yummmm. Glad you enjoyed it, Summer! Thanks for sharing! This looks insanely, incredibly good. Yummmmmmy! Delicious recipe! I was craving shrimp, pasta and asparagus tonight, so I made a few modifications to the recipe. I left out the spinach (but will try it with spinach next time), added the tops of four green onions, sliced, and a little white wine. Roasted asparagus with olive oil and a little sea salt, then placed two spears over the bowl of pasta. My high fodmap tolerant husband loved it! Thank you so much for the recipe! I loved this recipe! It was easy to make and delicious. I loved the addition of the red pepper flakes to give it a nice zip. I always forget about using shrimp in recipes, but it’s a great low Fodmap alternative to fish. I look forward to trying your other recipes. Thank you so much for creating easy recipes that my tummy likes! Any thoughts on if this would be good to have with “zoodles” instead? I’m trying to cut down on my carb intake, but this recipe is really yummy! Yes! Zoodles should definitely work in this recipe (and taste pretty yummy, too!) 🙂 I would stir uncooked zoodles in at the end of the recipe, heating until they are just warm. Thanks for the idea, Megan! This is delicious! I made it with a twist by adding lime leaves and finely chopped red pepper and garlic and fresh coriander for those who can. Also very yummy. Thanks for the inspiring recipes. Excellent recipe! I’ve recently become a low FODMAP-er due to escalating symptoms the last two years that has resulted in an IBS diagnosis. Your Ancient Harvest pasta suggestion was spot on. My girlfriend is gluten tolerant (gluten is my absolute worst trigger) and it’s been hard finding a pasta that she will eat. I no longer have to cook two different pastas for dinner because she loved this! The recipe, also, is fantastic. Excellent flavor spectrum. I used a whole lemon for juice, an extra tbs of butter right at the end, a tad more garlic olive oil, and 1 lb super large shrimp. I contemplated grating some fresh parmesan cheese on top but there was simply enough flavor to carry the pallet and nothing further was needed; anything more would have been overload. We ate it until stuffed with one big serving left for lunch. I’m totally going to be devouring your other recipes. Thanks Emily!! Quick, easy and delicious. Thank you for a great recipe! Thank YOU for the feedback, Theresa! I am so glad you enjoy this recipe, too!